Over the past year there’s been a lot of interest in The Guernsey Cow locally and on the web. Last summer we helped some folks from West Whiteland Township Historical Commission with piecing together and cataloging the remnants of The Cow sign they have stored in a local barn. Over the past many months, the Chester County Library main branch in Exton has been undergoing interior renovations. 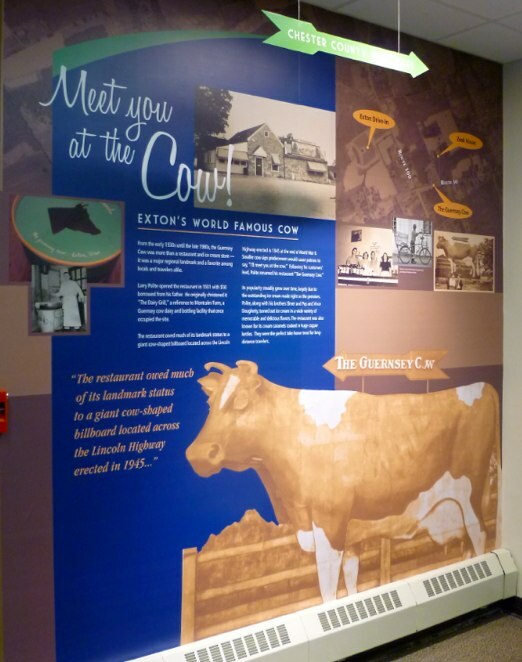 One result of their work is the newly installed wall seen below that memorializes The Guernsey Cow and its place in Exton history. Copy was provided by my brother, Brian at McGlinchey Communications. Most of the images come from the various bins of material that my grandmother kept over the years. She and my grandfather would be very pleased to see and know that The Guernsey Cow remains in the hearts of many and that lots of new people will be introduced to something they and many others put their hearts and lives into for so many years. photo provided by Jess Church, the designer at Merje who created the wall. Stop by the library in Exton, get some books and look for The Cow! Both the beauty and sometimes agony of going through my grandmother’s collection of things she’s saved over the years is that I often find nuggets of gold among things that I wonder why she saved. I know they all meant something to her and she had her reasons for saving either to look at later or to share with me and the rest of the family. I found the negative for this photo with a few other negatives in a pile of Christmas photos from the 1970s. 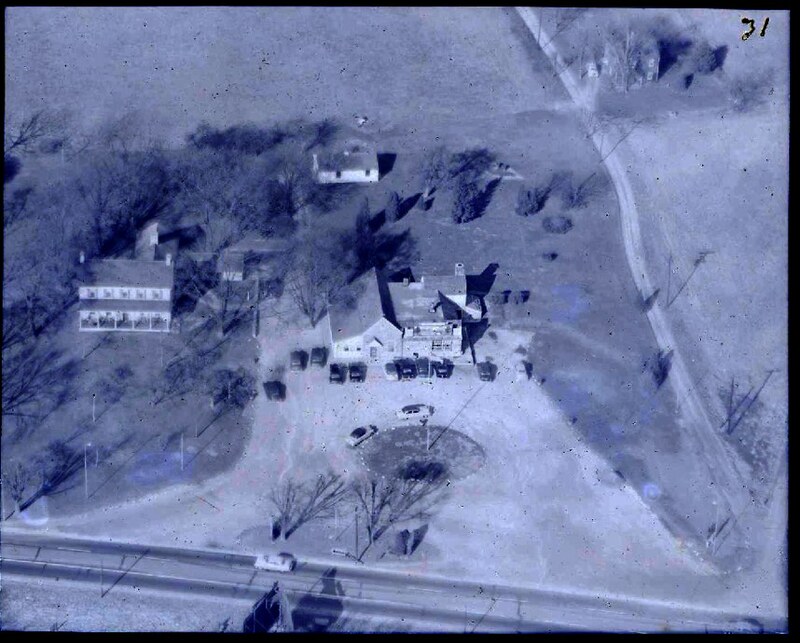 This is an aerial photo of The Guernsey Cow and Sleepy Hollow Hall (aka The Massey House) shot from the South side of the Lincoln Highway (Rte 30). I’m guessing that it’s late 1940s. Perhaps someone with a keener eye for cars can pinpoint it better. If you click on the photo you can see a larger version and see the shadow of The Cow billboard at the bottom as it appeared at the time. Note that The Cow billboard was built once World War II ended, so this could have been shot soon after The Cow was put in place. Also note the position of the sign. This was taken before the highway was widened and The Cow sign had to be moved. See the difference in position based on this photo from 1974. 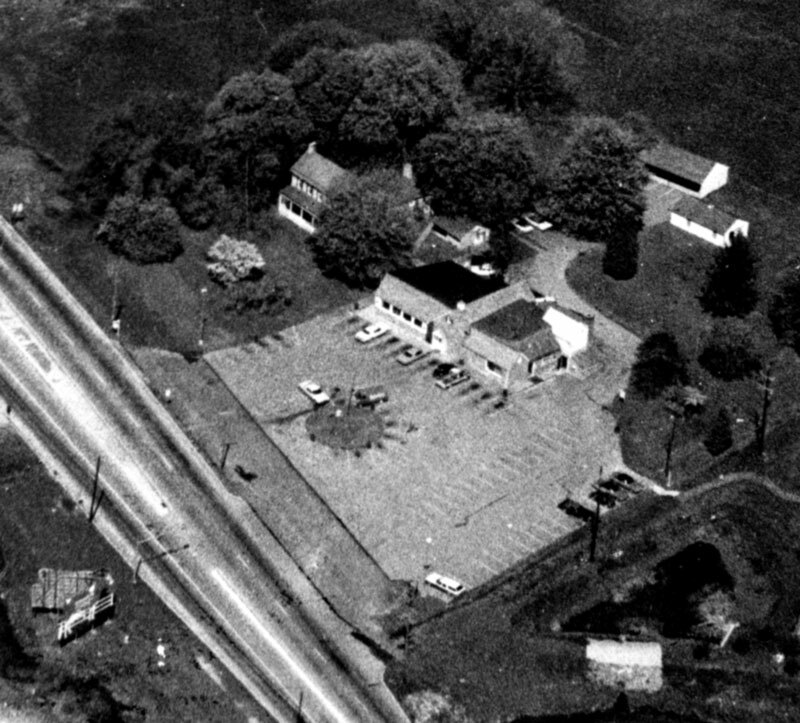 For other aerial shots of Exton and The Cow see my previous post. I just passed by the pile of newspaper clippings and paper in The Guernsey Cow bin and this card caught my eye. I read it and realized it has a little more ‘story’ and ‘hype’ than an earlier version of the history of The Cow that appeared on the back of a menu. 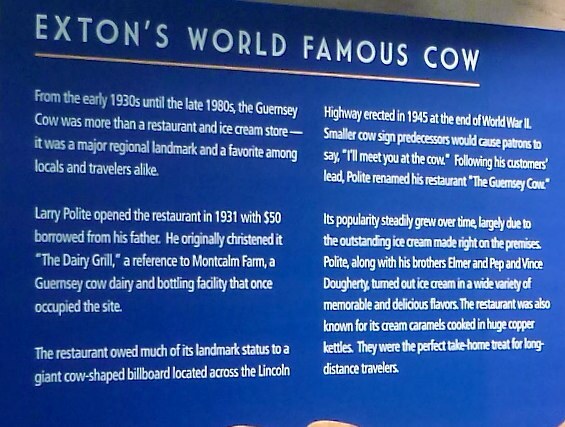 Permit us to welcome you to “The Guernsey Cow“, at Exton, where the Lincoln Highway (U.S. 30) crosses Route 100, just three miles south of the Downingtown interchange of the Pennsylvania Turnpike. Whether you be a neighbor from a nearby town or city, or a guest from Maine, Florida or California, call again, and again. No matter where you travel, you will never find ice cream with better flavor or cream caramels as smooth and of more healthful content than that served here, amde with dairy products from tested Guernsey Cows. The Guernsey Cow has been under the same management since 1931, and during that time we have taken great pride in serving the finest of Foods and Dairy Products. The manufacture of our own ice cream and famous cream caramels is done right on the premises, using the finest ingredients available anywhere. A majority of the many and unusual Guernsey Cow Ice Cream flavors are originals, not to be found in any other dairy store in the country. Our cream caramels are nationally and internationally known and are regularly sent all over the world, while our ice cream is occasionally flown to Europe to satisfy customer appetites. The store building originally was a barn, and the stones in the building, today, are part of that old structure. Through the years, since its construction, the original building has gone through many internal changes. From a produce stand, to a fluid milk dairy, through a wholesale ice cram plant, and an ice cream mix plant, The Dairy Grille finally emerged in 1931. 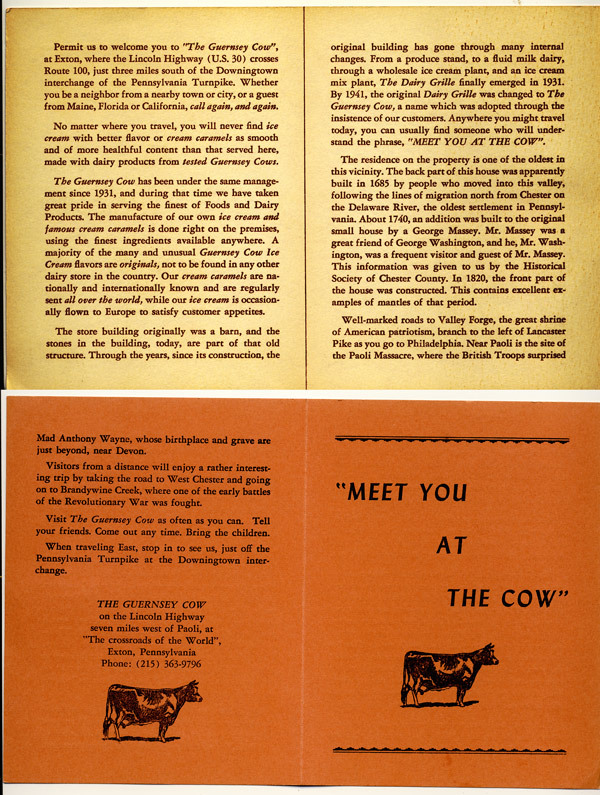 By 1941, the original Dairy Grille was changed to The Guernsey Cow, a name which was adopted through the insistence of our customers. Anywhere you might travel today, you can usually find someone who will understand the phrase, “MEET YOU AT THE COW“. The residence on the property is one of the oldest in this vicinity. The back part of this house was apparently built in 1685 by people who moved into this valley, following the lines of migration north from Chester on the Delaware River, the oldest settlement in Pennsylvania. About 1740, an addition was built to the original small house by a George Massey. Mr. Massey was a great friend of George Washington, and he, Mr. Washington, was a frequent visitor and guest of Mr. Massey. This information was given to us by the Historical Society of Chester County. In 1820, the front part of the house was constructed. This contains excellent examples of mantles of that period. Well-marked roads to Valley Forge, the great shrine of American patriotism, branch to the left of Lancaster Pike as you go to Philadelphia. Near Paoli is the site of the Paoli Massacre, where the British Troops surprised Mad Anthony Wayne, whose birthplace and grave ar just beyond, near Devon. Visitors from a distance will enjoy a rather interesting trip by taking the road to West Chester and going on to Brandywine Creek, where one of the early battles of the Revolutionary War was fought. Visit The Guernsey Cow as often as you can. Tell your friends. Come out any time. Bring the children. When traveling East, stop in to see us, just off the Pennsylvania Turnpike at the Downingtown interchange. The Philadelphia Extension of the Pennsylvania Turnpike was completed in 1950 which would have included the Downingtown interchange. The emphasis on the proximity of The Cow to the Downingtown interchange was probably a response to traffic that the turnpike drew away from what had been the main East-West corridor: the Lincoln Highway aka Lancaster Pike aka U.S. Rte 30. I like the phrase, “The crossroads of the world” to describe the intersection of Routes 100 & 30 in the center of Exton. I don’t know if that was something my grandfather created or whether other folks thought the same. I know we grew up thinking that’s what it was — and that the world thought the same. This image is in the archives at The Chester County Historical Society in West Chester. It’s the only one they have related to The Guernsey Cow in their archives. 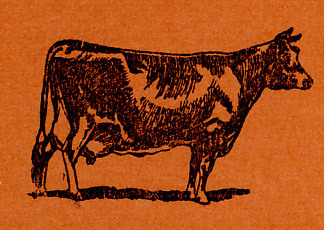 The Guernsey Cow was famous for its ice cream and for its hand-made cream caramels. The caramels were cooked up in huge copper kettles with big wooden paddles. The caramels were wrapped in branded wax paper and then stuffed into the tubs like those shown. The lid had a die-cut guernsey cow head in it that popped out and made a nice way of pulling caramels out as you needed. 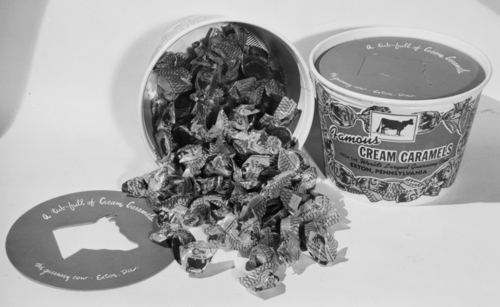 “Famous Cream Caramels from the World’s Largest Guernsey Cow” is the slogan on the side of the tub and as referenced in a previous post they were also famous among the famous. For the long-distance traveler they were the perfect take-home product when you couldn’t take the ice cream with you. I was digging around on West Chester Jim‘s history site recently and stumbled on a link for the Pennsylvania Geological Survey’s site for historical aerial photography of Pennsylvania. Mostly farm fields and woods. Here’s the same photo zoomed in on the crossroads of Routes 100 and 30 (the Lincoln Highway). Next I overlayed the same shot with a shot from 1971. The Exton Square Mall had not yet been developed but the Exton Drive-In is there (can you find it?). Plenty of housing and commercial development are starting to show their marks on the West Whiteland landscape. The photo below is a shot of The Guernsey Cow around 1974 or 75 after The Exton Square Mall was put in and the K-Mart and Exton Cinema were under construction. My grandfather had this in his office and my older brother has it on display in his home now. A close-up below shows The Cow property, Sleepy Hollow Hall (aka The Massey House) and The Guernsey Cow sign across Lancaster Highway. And another overlay below using Google Maps shows the level of development in the crossroads today 30 years later. The Guernsey Cow property below as it is today as the DNBFirst bank. Sometime in the late 1940s or early 1950s a truck carrying cows either overturned or broke down along the Lincoln Highway in Exton, PA in front of The Guernsey Cow. The cows, on the loose, were drawn to the giant Guernsey Cow billboard and milled around in its shade and that of the nearby trees. Meanwhile, serious men stood by pondering the best action to take.